I have landed in the 13th century village of Montefollonico (population 700), 30 minutes south of Siena, in the heart of Tuscany. It is in the middle of rolling hills, vineyards, villas and olive groves in the Chiana Valley. Each view is better than the last. This Culinary vacation is taking me inside the stone walls of villages that dot the country side. Along with learning to cook, I will go inside cellars of century-old wineries, watch cheese makers work their farms and the women of Montefollonico work magic in local kitchens. I quickly find that I am not a tourist, but a local sharing a greeting of “Buongiorno” with the locals each morning. It’s as if I’ve known them my entire life! The cooking classes are like no other…there are no fancy blenders or chefs in tall hats. The kitchen is busy with wooden spoons and women who look and act like a distant family member. The women are delightful and demanding at the same time and each entertains differently, each is loveable. If I close my eyes I am a child in my Nonna’s (Grandmother’s) kitchen, sitting near the stove as she stirs the spaghetti sauce and I smell the fresh bread baking. I can hear my aunts speaking in the back room as they peal the fresh tomatoes and gather the basil. There are no food processors here, everything is done by hand. The wooden rolling pin is the tool of choice. This region’s cuisine is based on simplicity and fresh ingredients. The words that keep ringing throughout this Italian kitchen are: “no di lavoro, non mangiare.” Which means, “No working, no eating.” Here…if you want to eat lunch, you have to help cook. This is a full-participation class! Class ends at a beautiful table set with linens from the Montipulciano market. Our glasses are filled with locally-made Vin Santo wine and we toast our teachers as we enjoy another 4-course Tuscan meal. It is then I realize a week with “Cook In Tuscany” is not just a vacation, it’s a trip back in time, and it’s a trip back to my childhood. My trip was made possible because of my two hosts: George and Linda Meyers. George, a pilot and Linda, a school teacher, spent their summers traveling the world in search of local customs. “I never wanted to be a tourist--I wanted to be a local,” says Linda of her years of travel. “I found myself bringing home souvenirs from local grocery stores.” During his journeys, George has cooked and eaten in both obscure and off-the-beaten path kitchens around the world, as well as restaurants run by famous Michelin-starred chefs. “I want to share my experiences and passion with our guests,” says George. 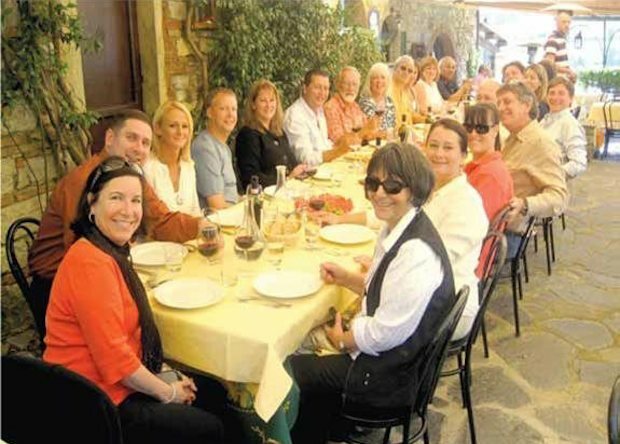 With a love of food and travel, George and Linda found their calling in Tuscany. On a trip to Italy many years ago George and Linda fell so in love with the village and people of Montefollonico, they decided to stay! George, Linda and their micro dachshund, Talula, live in the village, so you can often find guests sitting with George in his backyard drinking locally made wine (or sweet tea) and telling stories. As the days went by, I somehow felt refreshed and not so ready to return to my so called “real life.” I discovered that my trip to Cook in Tuscany was not a trip, but instead an insight that life can be simple, jam-packed and fun…all at the same time. The trip has forever changed my view of vacations and being a tourist. No more chain hotels or massive all-you-can eat buffets for me—from now on, I want to be a local and melt into the culture. As I leave and walk thru the 13th century castle gate, I find myself checking my calendar to book my return visit to Cook In Tuscany. 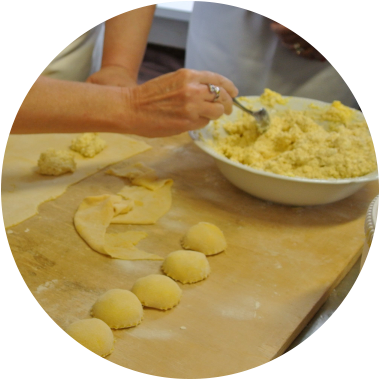 So, roll up your sleeves and come roll pasta in Montefollonico! At Cook In Tuscany, eating isn’t an event, it’s a lifestyle.